The council ran the share an idea initiative to find out what the people wanted to see in the rebuild of the city. And common themes started to emerge, a people friendly, green city, with great public transport, a pedestrian and cycle friendly city. 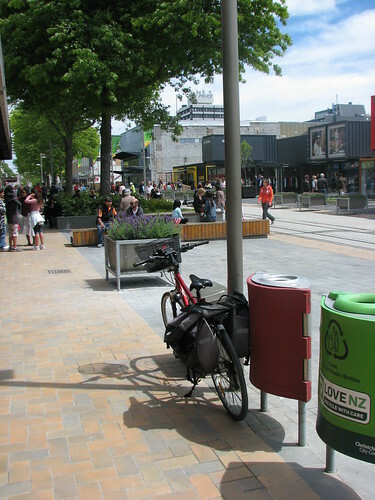 When the rebuild began, it looked like we might finally get the city I’d always dreamed Christchurch could be, a great cycling city. But the reality is, the rebuild began the day after the earthquake. We’re not waiting for it to happen, it’s happening now. I’d love to be positive about the direction the work has taken so far, but it looks like the same old same old. Below are a few example of ways cycling has been integrated into the major projects undertaken so far. For the past few years, the cities buses have been gradually being fitted with cycle racks. This is a great initiative, but it had a small problem. It was not possible, for safety reasons due to the layout, to load bikes onto the buses in the cities central bus exchange. 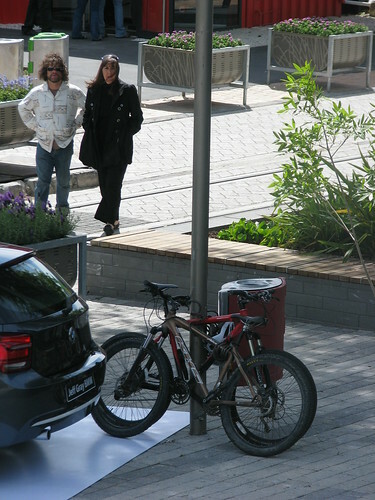 This is fair enough, the exchange preceded the bike racks by many years, and it’s successor could be designed without this problem. The opportunity came earlier than expected, and a temporary bus station has been built to take the place of the damaged bus exchange, and is expected to be in operation for at least 2 years. And guess what? 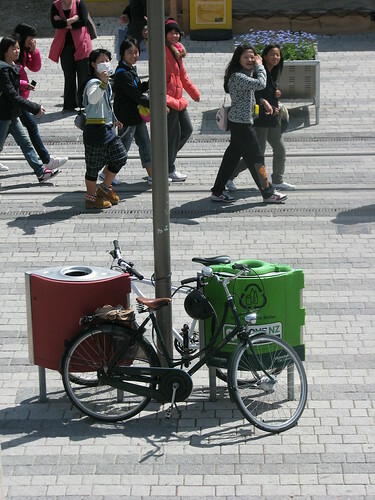 You still cannot load your bike onto bike racks in the new central station, with lack of space being cited. 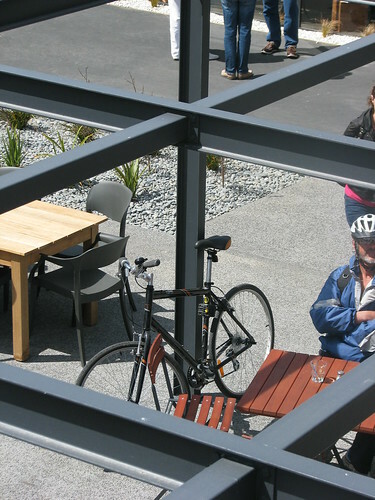 One of the most exciting projects in the central city is the ‘RE:Start’ project. 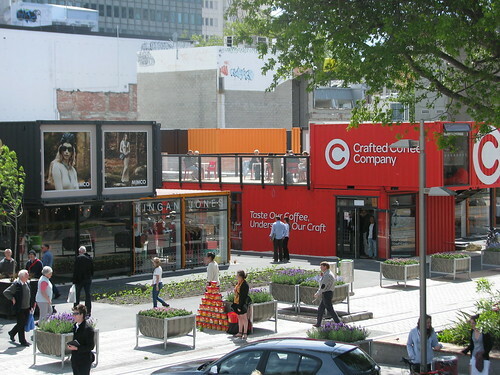 A retail precinct has been constructed using shipping containers in part of the Cashel Mall, one of the pedestrianised areas in the heart of the city. The project has created a really funky space, vibrant space. Personally, I feel the space is an order of magnitude better than before the quake. But yet again, we have zero provision for cycles in this space. 3 large car parks have been set up, making access by car incredibly easy. 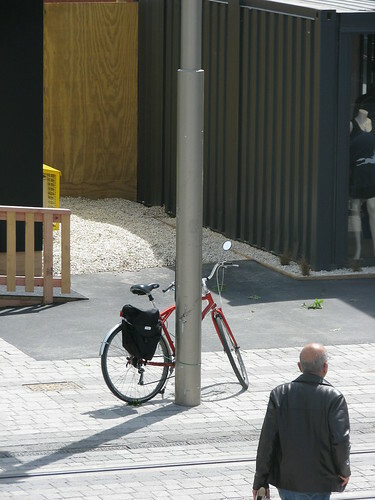 As reported elsewhere by James Dann it seems to be a glaring ommission for our new, supposedly cycle friendly CBD. city”. This was far from that. of the city plan seems to have already been forgotten. It’s not like there isn’t a demand, people are locking their bikes to anything that doesn’t move. I suggest you do the same, make the ommission obvious. 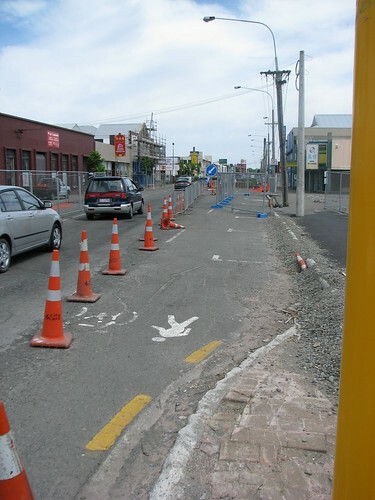 Off road cycle paths are pretty rare in Christchurch, with painted cycle lanes on the road more commonplace. One of the few off road cycle paths that we do have on Rolleston Avenue was closed for nearly 2 months in August to make way for an art installation about sustainable development. I’m not really a fan of the kind article that I’ve just written. I much prefer a positive angle. So I thought I’d better write up all the pro-cycling work that has been carried out for balance. This is really the only thing I can find. 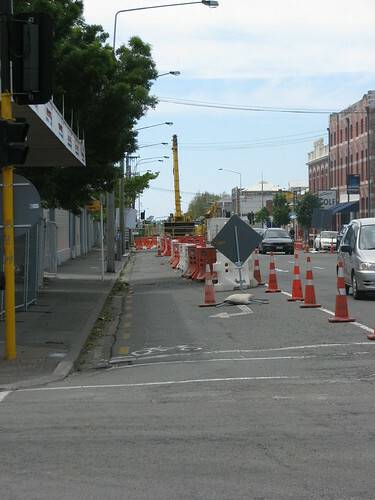 A bike lane has been set up on St Asaph Street, shared with pedestrians. This is great. It represents one of the only east-west routes accross the CBD, and it’s great that a little common sense has been applied to give cyclists a physically seperate path on this road. It’s low tech, but given the circumstances, I’ll take it. Yet, the fact that this is really the best and only piece of bike friendly work I can find in the whole city is fairly sad. If there are other, better projects that have taken place please let me know and I’ll add them. In conclusion, I’m afraid I’m not very hopefull that the city is going to be transferred into the cycling utopia it could so easily be. Please, City Council, prove me wrong. Please.